The Primary kids I work with are energetic and love having fun, so I’ve found that a game or contest helps keep their attention. However, they’re also very competitive, which can quickly turn a fun game into a vortex of negative feelings. Here are a few tips I’ve discovered to keep games positive at activity days, Scouts, or other Primary functions. Leaders vs. kids. Instead of dividing the children and turning them against each other, put them all on the same team and have them compete against you. I’ve found that even if they don’t win, they take comfort in being a team. Race against the clock. This is especially fun for relay games (like team scripture chase). Some kids might always take longer than others to complete a task, but when anyone improves, the whole team gets a better time. No-winner games. Sometimes the objective of the game is just to create something cool or silly together. Games in a “telephone” or “add-on” format encourage everyone to participate because each child brings something new to the mix. Make a no-bragging rule. In football, players are allowed to congratulate each other and celebrate successes, but actions that seem intentionally boastful or unsportsmanlike are penalized. I’d like to try making a similar rule and see if it helps. If you have children who struggle with fearful or anxious feelings, we wanted to make sure you saw the story “Brave Enough?” in the October 2016 Friend. Many Friend stories that deal with fear model things children can do to cope with and overcome scared feelings—sing Primary songs, look at comforting pictures, and pray, for example. But what if these don’t work? In this month’s story, Christine finally decides to ask her big brother for help. We hope this sends a message loud and clear to children that it’s OK to ask for help! It’s a message that some adults could benefit from, too. For additional resources to help children deal with anxious feelings, visit the “Fear/Worry” topic on this site. My extended family made some personalized game pieces that are really cute. They cut out pictures of family members that were roughly the same size and mounted them to cardstock. They use a clip to weigh down each piece. Ever since seeing these, I’ve been brainstorming ways to use them with kids. Here are a few from my list—what other ideas do you have? Some families use homemade gifts as Christmas presents. These are simple enough that a child could make them with a little help! If you used pictures of relatives you don’t see very often, it could help your kids learn the names and faces of these faraway loved ones while playing games. Consider making non-family sets: have each kid draw a tiny picture of their favorite scripture hero, for example, and make a set using the illustrations. 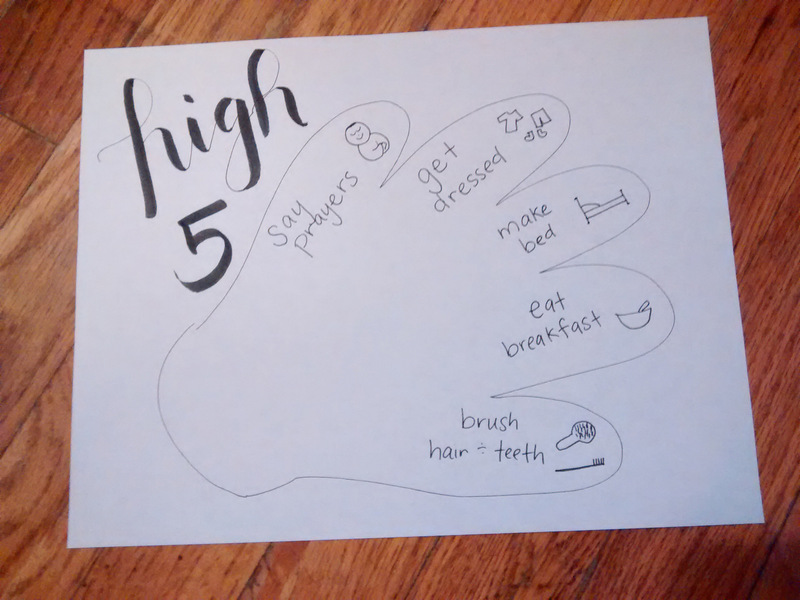 To help streamline our morning routine with five small kids, I drew a handprint on a piece of paper and labeled each of the fingers with a daily task. For our family, these are get dressed, make bed, say prayers, eat breakfast, and brush teeth and hair. I drew small pictures to illustrate each item to help my younger non-readers. Once the children have completed each item on the hand, they get to give me a high five! This has been a positive way to establish good habits, and helps limit the nagging I need to do during our morning routine.